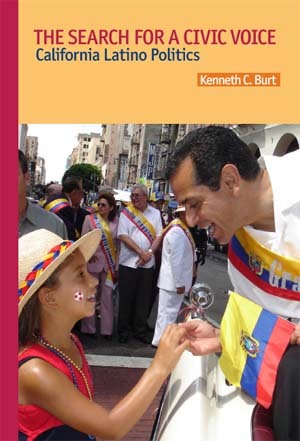 “Kenneth Burt has constructed an impressive study of Latino politics in California from 1939 to 2005… making it an excellent source of historical information. The book also seeks the lessons that can be learned by present day and future political activists. “Burt argues that voter registration drives were crucial to the successes of Latino political organizations by the early community activists… Another key to Latino political gains has been the organization of an expanding web of political alliances. “Burt’s findings hold significance for political activists and Latino candidates who seek to raise the level of Latino involvement in politics. “Kenneth C. Burt [is the] author of an excellent new book. The Search For A Civic Voice: California Latino Politics. Burt tells the story of Latino politics from before World War II to the present day. His book explains the long and difficult Latino rise to present day influence and shows the complexities and subtleties of the Latino community in a way missed by the mainstream news media. “Burt hopes to spread a history lesson he believes Latino activists should heed: Latinos have gained politically when they have formed working coalitions with other groups, and they have foundered when they have focused inwardly“. “The Search for a Civic Voice: California Latino Politics, by Kenneth C. Burt with foreword by Antonio Villaraigosa, looks at the growing Latino political influence in California. It tells the story of how Latinos emerged from the sidelines of civic life to the large and expanding role Latinos currently hold. “The book attempts to answer how modern Latino politics began and identify the players involved in the legacy of these political pioneers. It connects the state of politics in California today with how it was influenced by its predecessors. “Though The Search For a Civic Voice begins as a story of firsts, these events do not emerge in a vacuum. The study of the coalitions built by Latino political pioneers and their descendents among labor, business, religious and other groups sheds light on the organic process of an immigrant community finding its civic voice,’ Burt writes in the introduction. The author is the political director of the California Federation of Teachers. – “New Reads,“ Hispanic Link Weekly Report, Washington D.C.
Order The Search for a Civic Voice: California Latino Politics through Barnes and Noble or Amazon.